The Provincial Government of Bulacan and City Government of Malolos, in collaboration with Heritage Conservation Society (HCS), Bulacan HCS Chapter, Urban Partnerships Foundation (UPF) and the Philippine Institute of Environmental Planners (PIEP), hosts the 5th Annual Conference on Philippine Towns and Cities (PTC), November 5 to 6, 2010 at the Hiyas Pavilion, Bulacan Provincial Capitol, MacArthur Highway, Malolos, Bulacan. PTC aims to enhance civic engagement with local governments units in order to inform and guide the LGUs on the proper care and utilization of a valuable asset — built heritage resources. Highlights this year include a briefing on the National Cultural Heritage Act of 2009 (RA 10066), lecture and training on cultural mapping, heritage identification and documentation, the Lakbay Republika ng Malolos Heritage Tour and experience riding on a Karatig jeep, Bulacan Artists Art Exhibit launch, photo exhibit of bridges, Art Deco buildings and lighthouses, cultural presentation of Bulacan's Lakan Sining and case studies of selected Philippine towns and cities namely Malolos, Bulacan; Sta. 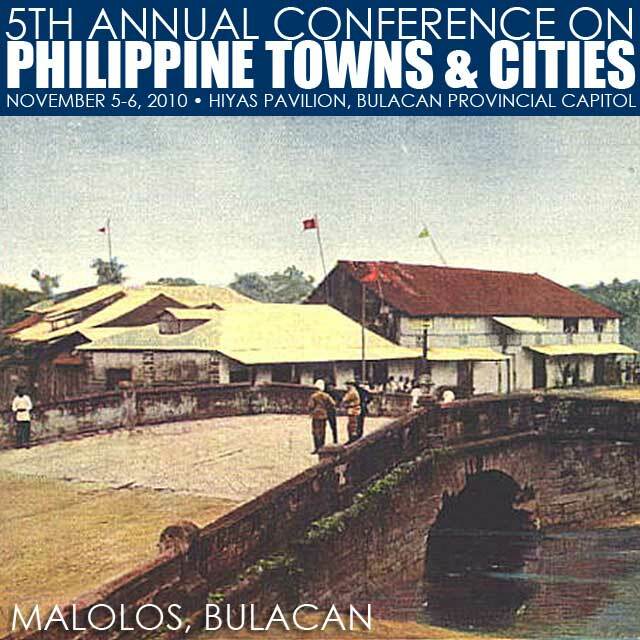 Ana, Manila; Hagonoy, Bulacan; and Antipolo, Rizal. For more information, contact Dorie Soriano or Luz Regalado of the Heritage Conservation Society at (02) 5466367, (02) 3534494, (0917) 8668853, (0906) 2625631 or e-mail hcs_secretariat@yahoo.com; Rheeza Hernandez (Bulacan HCS) at bul_heritage_conservation@yahoo.com, (0915) 4339438; or Arch. Osie Alfonso (Bulacan HCS) at jcbal2004@yahoo.com, (0917) 909768 or (02) 2380887. Good info about Phils. I just came back from Phils 3 weeks ago. Spent 3 1 week in Baguio and 3 days in Angeles City. It was nice.